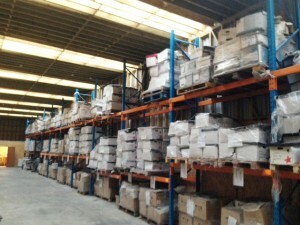 Our pallet storage service allows for blocked or stacked pallets, containers and smaller items on shelving. Our pallet storage in Surrey is secure, with full alarm systems and CCTV. Access is available during office hours or by mutually agreed appointment whenever possible. We are more than happy to accommodate most requests from our clients. If you have a specific request please ask. Our pallet storage is there to be filled! Our location is ideally situated for residents of Croydon, Purley, Kenley, Coulsdon, Shirley, Addiscombe, Whyteleafe, Selsdon, Selhurst, Wallington, Beddington, Hackbridge, Sutton, Cheam, Belmont, Carshalton, Woodcote, Banstead, Mitcham, Thornton Heath and surrounding Surrey areas as far as Guildford! We have a huge variety of storage solution as well as our pallet storage facilities at the Steve Frieze warehouse in Surrey. We have a large expanse of space at your disposal if or when you need it. Temporary or long term storage from a box of relatively small documents, to a container system that can store your entire home is available. Short or long term, and made totally secure by CCTV and Alarm systems. Individual storage quotes are free and without obligation. Prices depend upon the value of the goods for insurance purposes and the capacity you may require.